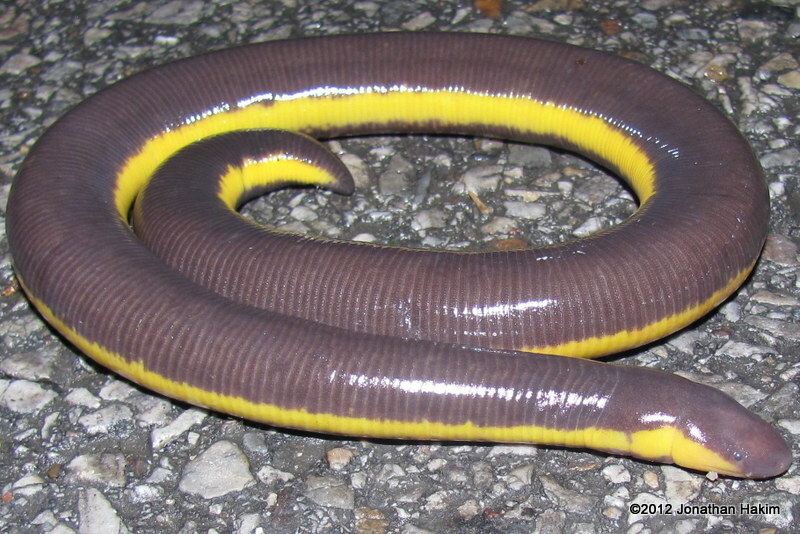 Five DOR Yellow-striped Caecilians found on one stretch of road. 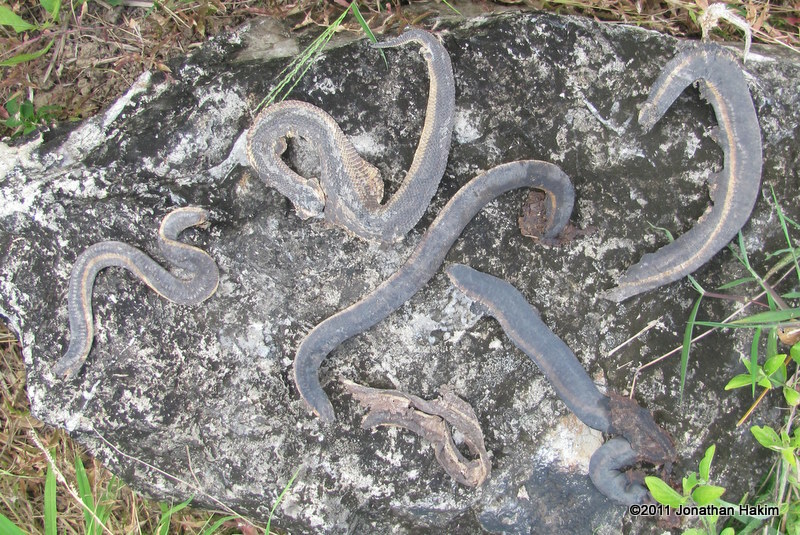 For comparison, a DOR Yellow-bellied Water Snake (top middle) is included in the picture. Description: To 35cm long. Notable for its lack of limbs, leading to an appearance similar to a large worm or eel. 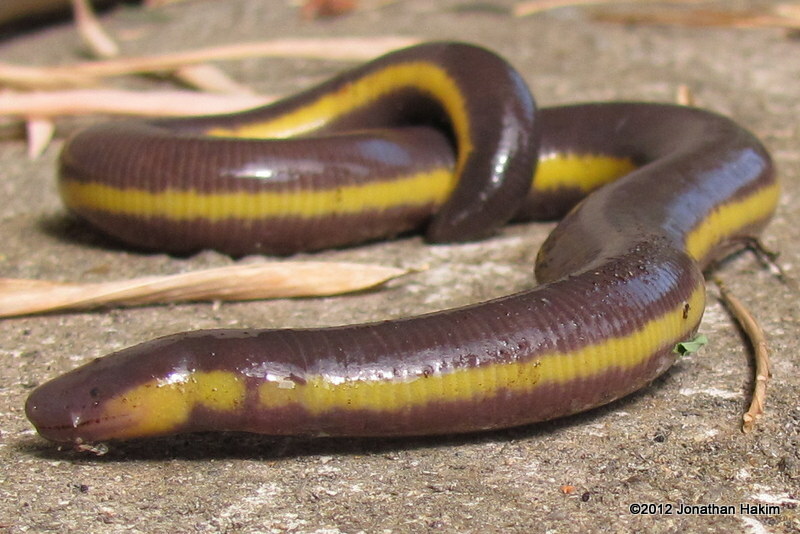 Coloration is black to purplish-gray with a broad yellow stripe on each side. Head is smaller than body and flat at end, with small eyes covered by skin. There is a tiny light tentacle just above the mouth between the eye and the nose. Tail is blunt. 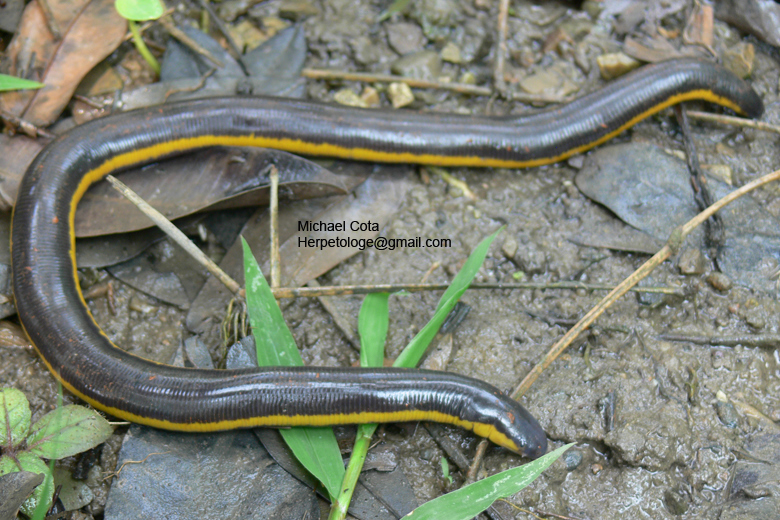 Similar Species: No other caecilians are found in our area, and no other amphibian looks like a caecilian. 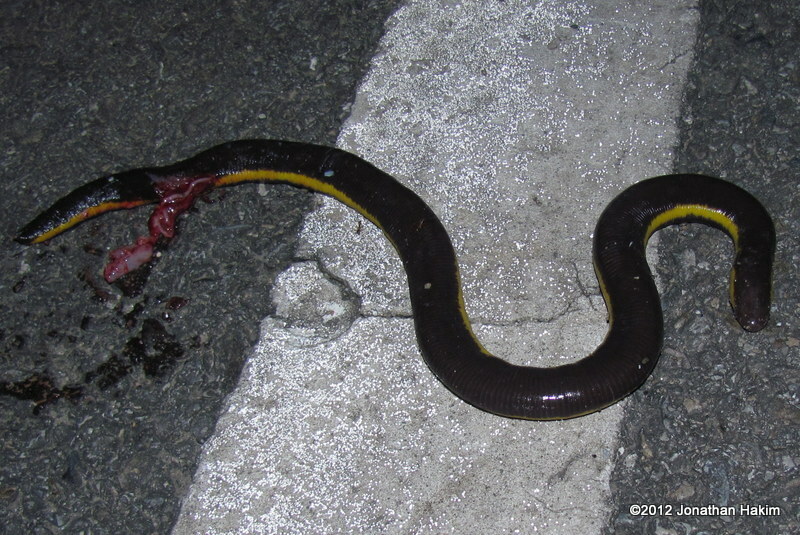 Yellow-bellied Water Snake has scales, a yellow belly, thin tail, and the distinct head of a snake. 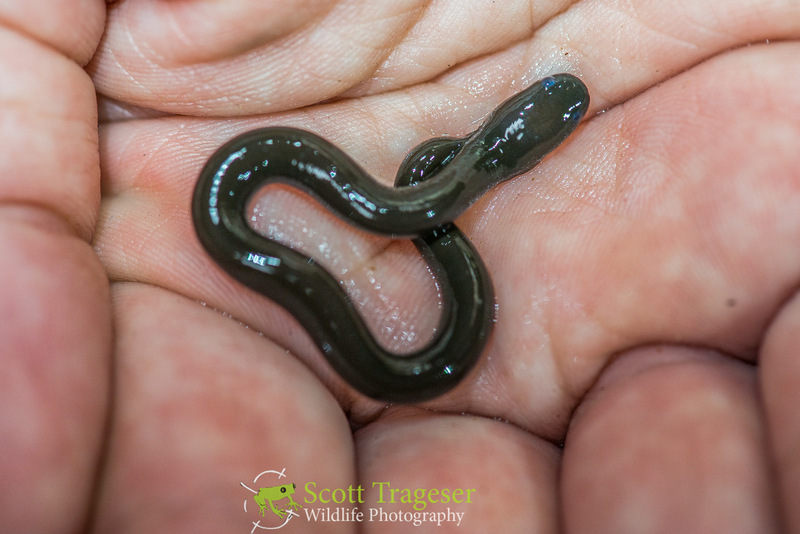 Worms lack eyes and have bodies that can stretch and contract. Habitat: Forest, marshes, scrub, agricultural land, and gardens. Usually found underground, but will enter leaf litter and vegetation during the rainy season and make even be found out in the open at night. Contribution to the ecosystem: Helps control invertebrate populations. Provides food for snakes and monitors. Danger to humans: No danger to humans. 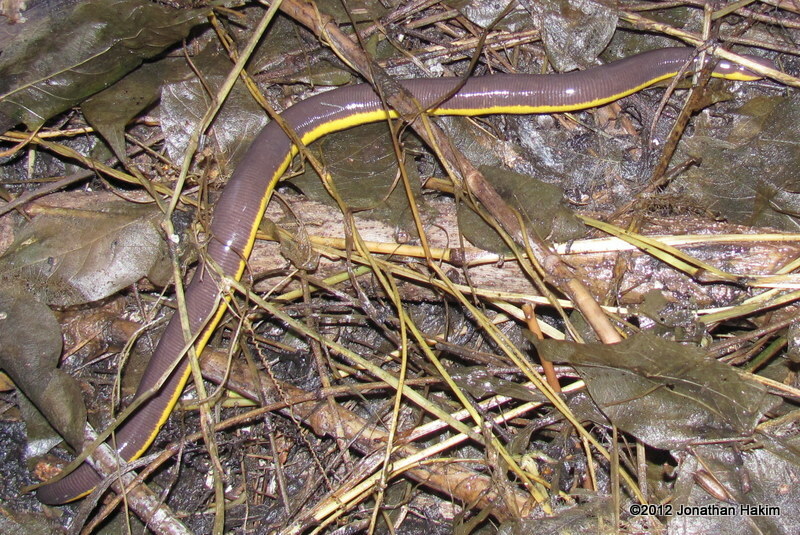 Conservation status and threats: The Yellow-striped Caecilian is listed as a species of “least concern”, due to its broad range and ability to utilize many human-disturbed habitats. 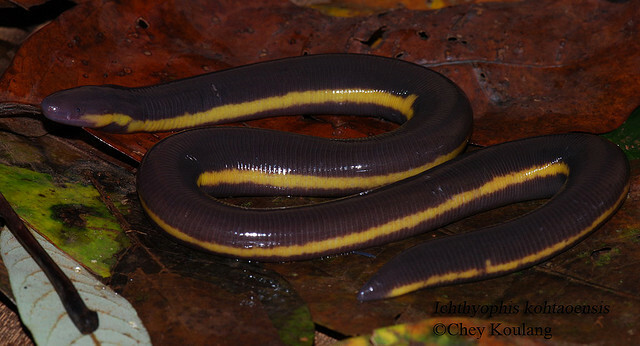 However, it is possible that many caecilians currently attributed to this species will be designated as new species, so the range of individual species may be far smaller. 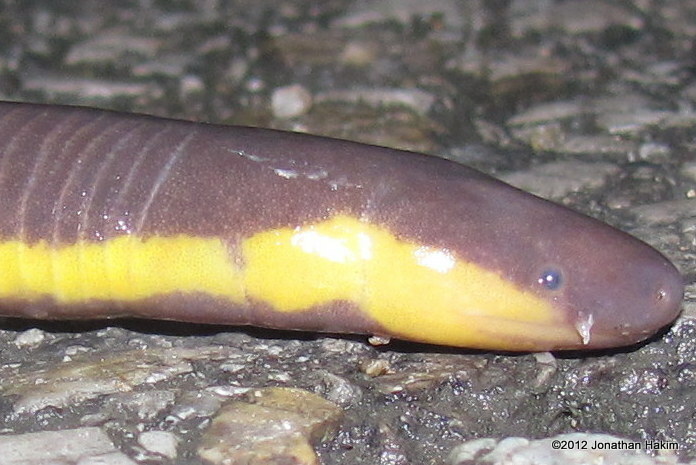 Interesting facts: The Yellow-striped Caecilian lays its eggs in burrows and cavities on land, but the larvae are aquatic, moving into streams, ponds, and pools after hatching. 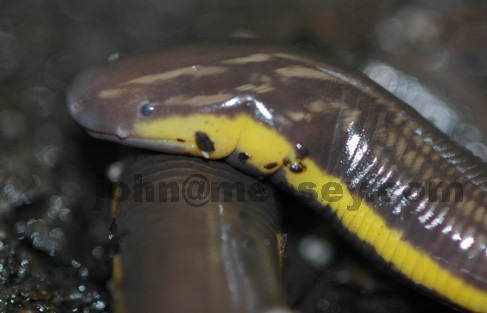 They have small gills and a tail fin, which disappear during metamorphosis into adulthood. Adults retain two small tentacles on the head, which likely add to their sense of smell.